Panama City Beach officials – along with the Florida Department of Environmental Protection, Corp of Engineers and the Florida Department of Fish & Wildlife – developed an innovative system to restore thousands of acres of protected wetlands, leading to the creation of the 2,900-acre Panama City Beach Conservation Park. The Panama City Beach Conservation Park protects and balances our natural environment while providing amazing outdoor recreational opportunities to visitors. The 2,900-acre park is a safeguard for wetlands, wildlife and pine forest, while also acting as a natural filter that balances treated water before it makes its way to the St. Andrews Bay. 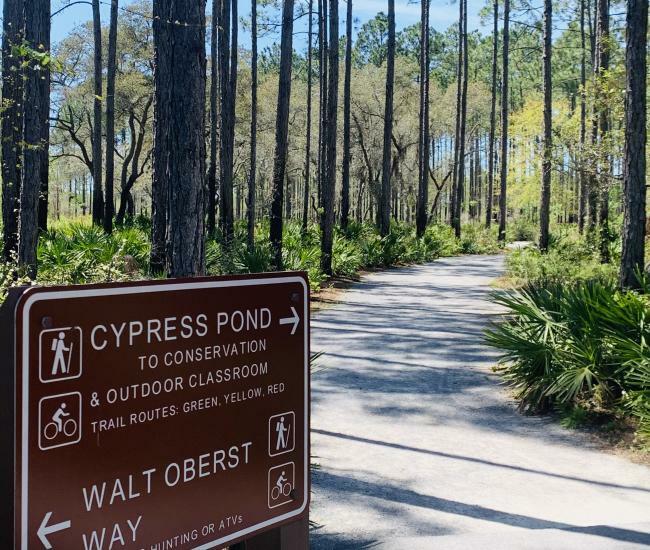 Visitors can enjoy the park’s boardwalks and 24 miles of unpaved trails as they hike, bicycle, or run loops that range from half-a-mile to 12-miles. Paved Gayle’s Trails connect the conservation park trails with other trail systems throughout the beach and honors one of the project’s visionaries, Mayor Gayle Oberst. Public restrooms, picnic areas, a guide to local flora & fauna, and a pavilion are located near the main parking lot, and an outdoor classroom provides a venue for group educational and enrichment opportunities. Additionally, eight boardwalks totaling over a mile in length are scattered throughout the park, allowing excellent viewing of natural wetland areas. Trails are open daily from sunrise to sunset. Dogs are permitted on leashes. No motorized vehicles of any kind or horses are allowed on the trails. No overnight stays, campfires, smoking or open flames allowed. For a full list of rules visit the Park's website.